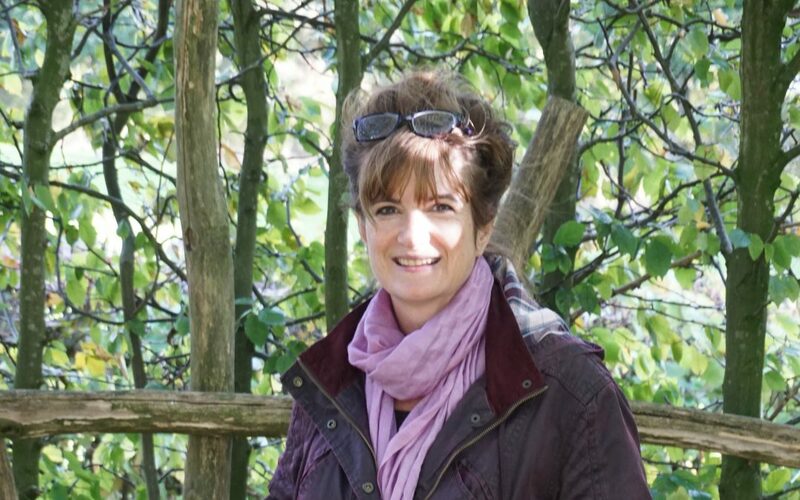 It is our pleasure to shine the spotlight on, and introduce to you: Genista Copeland – a past student of the British Academy of Floral Art and now the owner of Acanthus Flowers and Home in the market town of Shaftesbury in Dorset. Many moons ago I took a degree in fashion and textiles specialising in embroidery and then had a business making wedding dresses and ball gowns in Bath. All through university, I had jobs I loved in restaurants, and after losing my premises I became a caterer and had a variety of small businesses from a fine dining restaurant to corporate buffet contracts. Eventually, after many years in Yorkshire, I relocated back to the west country and ran a company providing the catering for Neal’s Yard Remedies. It was here that I enjoyed making naturalistic arrangements from their herb gardens to decorate the premises and having moved to a house with a third of an acre of an overgrown garden I became a passionate gardener. Over the years work was something I did when not gardening! I loved working the soil, watching shoots emerge, seeing young plants grow strongly and of course I loved the bounty that came with a big garden and having flowers galore for the house and for presents which were always well received. Friends loved their bouquets because they said they’d never be able to make flowers they bought look like that and it was then that I realised that not everyone can arrange a pot of flowers well, even though it was something I had always taken for granted. A garden big or small is a thing to treasure, the satisfaction and benefits of tending one are immense and my only regret with my shop is not being able to spend as much time as I would like in my garden. There’s nothing to beat a sunny spring day in the garden, birds singing, tiny shoots unfurling and all the promise of the year to come. What was your thought process for choosing the Academy? Well, the years rolled by and as I approached my ten year anniversary at NYR I started to think about retraining as a florist. Having talked to a local florist who had also started later in life I realised that the local college wasn’t going to be the right place for me and that I would need a fast track environment. I looked at courses on the web and eventually decided that the Academy of Floral Art seemed to be the only place where I would get practical professional training rather than hobby style lessons. Although Dunchideock was a long way away, it was a relatively simple drive and only once a week, so I booked my place. What courses have you completed with the Academy? I decided to do three courses over a year – Hand-tied, Arrangements and Weddings. There were only six or seven people on the course, and we all had different aims, so it was interesting to talk to people about their business ideas. It was here that my previous training in design came into its own, embroidery design is very like floristry design, it’s all about colour, texture and space. A few weeks into the course I managed to get a freelance job in a florist that was entirely new and where the owner had just got to the point of needing some affordable help. I didn’t think about having my own shop at the time because every small town in this area has a florist and there just wasn’t room for another one. Since leaving, I have taken courses with Francoise Weeks and Gregor Lersch. What value do you place on floral education? An excellent floral education is essential to succeed in the business, from what I have seen of and heard from local college graduates the Academy courses are far superior but I do feel that there’s no substitute for working in a business before you start your own. In business there’s so much that no course can prepare you for and it’s far better to learn from your mistakes before you start your own business! I well remember having to confess to my boss that I had ruined 5 amaryllis whilst trying all afternoon to put them into a huge mixed bouquet. She simply cut the squashed stems short, tied them in a bunch and hung them upside down filling the stems with water as a decoration and idea for customers to try. My business came into being extremely quickly, three weeks after being told where I worked would close the following day I opened the doors to my own shop elsewhere on the high street. This area is full of florists, so I knew I had to move very quickly to get open before anyone else thought of taking over where the shop already was. I didn’t write a full business plan perse I just calculated what my turnover would need to be to cover the business expenses on a sliding scale from getting by to making a good living. 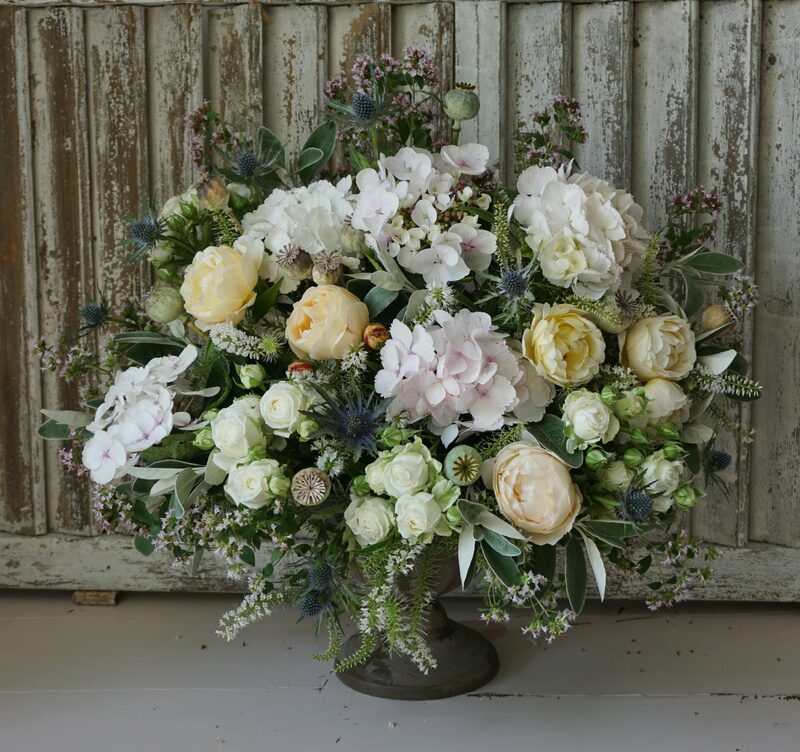 Having already worked in a florist in the same town I had a good idea of what was possible, so it wasn’t like taking a step into the unknown; also I have spent most of my life running my own businesses, so I wasn’t worried about setting up on my own. What is your company name and how did you choose it? My shop is called Acanthus. I wanted a plant name that was easy to pronounce and began with the letter A which gives you an advantage in listings which are often alphabetical. I love making hand-tied bouquets more than anything, so I always wanted to have a shop rather than be a wedding florist. Flowers are a real tonic, and the joy or consolation they bring is unbeatable value for money. In my book, there’s nothing nicer than making a beautiful hand-tie for someone. I see my shop as a little stage set that’s ever changing with the seasons. I love doing the window displays and have as much outside as I can to tempt people into the shop. I have put larch branches around the entrance which I then add to through the seasons, this month it has cherry blossom in it, last month catkins, December it had white doves, frosted white roses and fairy lights gaining it the reputation of the prettiest shop in town. I am about to start making some nests with birds in for Easter…. My goal is to grow my business and my assistant to the point where I can work four days and eventually three days a week. On the way to this, I want to become the premier florist in this area for quality and value. I felt I was on the way last month when a person I was delivering to told me that everyone was talking about my shop and that apparently, “it’s the best florist ever”! It’s hard to make a living just selling flowers, so I also sell a lot of pots, vases and home accessories which are plant/bird themed. 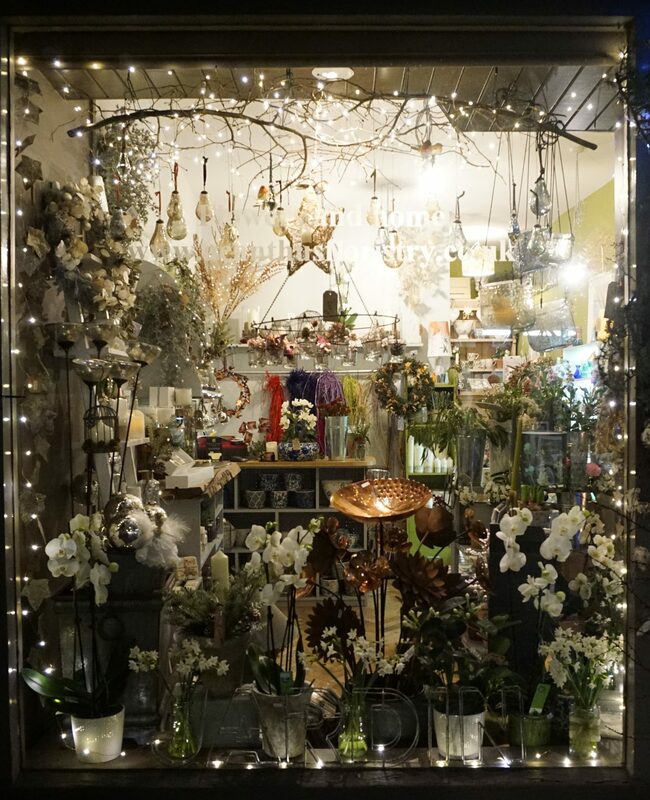 I have just opened a garden room at the back of the shop stocking larger containers and decorative pieces for outside and in alongside the very best in artificial flowers. Later this year I hope to get onto my idea for making very beautiful bridal headdresses from beautiful textiles, beads, jewels and artificial flowers. I also love making fresh flower jewellery and hope that this is something different I can offer to brides. What top tips can you share with us all? Never settle for anything less than perfection in your work. I have a selection of posies and bouquets outside, and I hear people all day saying that they can’t be real, they are too perfect. Job done! Give excellent customer service because it definitely makes you stand out. Gift wrap even the smallest thing, brown paper and raffia makes a gift of a primrose, costs very little and makes someone spending 1.50 feel valued. They always come back.